by the lush Mediterranean vegetation. We recommend the hotel to sea lovers and families, but also to those who want to discover the many treatments offered by one of the most famous Thalasso centres of the Mediterranean. Worth noting is the rich buffet, suggested to people who love eating good local and international cuisine every day. 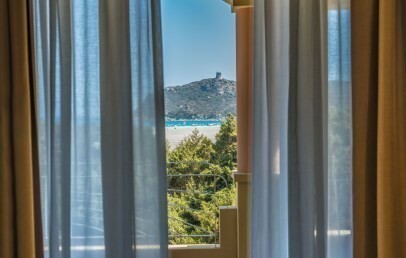 In the bay of Villasimius, in the heart of a region of extraordinary beauty, between the southern – east part of the Island and the Marine protected area of Capo Carbonara, the Pullman Timi Ama enjoys here of a stunning location. Surrounded by Mediterranean “macchia”, the Pullman Timi Ama property cover 11 hectar of land divided from the sea from a salted lake. The hotel is located just 2 km from the lively town of Villasimius and 55 km from the international airport of Cagliari Elmas. 275 rooms divided in 3 floors with 5 elevators. The rooms can be on the garden side or sea side and all have either balcony or terrace, air condition, internet connection Wi-Fi, television with satellite channels, safe, minibar. Classic – 20 sq.m., traditional style double room with bathroom (some without window) with shower, balcony ore terrace, bay or garden view. Superior – 25 to 30 sq.m., traditional style room with bathroom with shower and tub, 3rd and 4th bed on request, bay or garden view. Executive – 25 to 30 sq.m., refurbished rooms, located on the upper floors, bathroom with shower and tub, 3rd and 4th bed upon request, balcony with garden view or bay side. 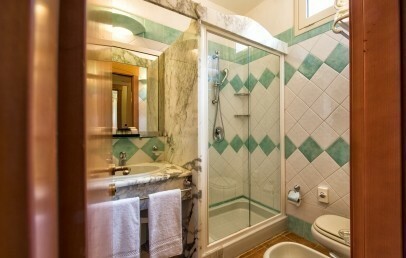 Deluxe – 30 to 35 sq.m., bathroom with shower and tub, balcony or terrace, bay or garden view. Four Suites (Marina 1, Marina 2, Fiorentina, Baldacchino) – garden side, 35 to 70 sqm. The fine white sandy beach is approx. 500 m from the hotel building away. It is considered as one of the most beautiful beach of the entire island. The beach has sun umbrellas, sun loungers, a snack bar and can be comfortably reached with the shuttle-service. For anyone who likes to do any group activities, the staff of the animation does organize different types of entertainment. Starting from the 3rd row, the sun umbrella and loungers are free of charge. The 1st and 2nd row are available with a surcharge: € 70 per day for the first row and € 50,00 per day for the second row. Subject to change. The Thalasso-therapy Centre at Pullman Timi Ama Sardegna is directly connected to the hotel, and represents the highlight in the services of this hotel. 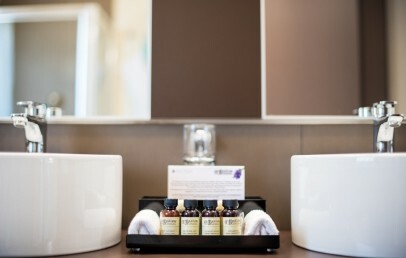 The centre is opened daily and allows clients to begin any treatment every day of the week. Upon booking you may request further information about all the available packages at “Pullman Timi Ama Sardegna Thalasso-therapy Centre”. It will be our pleasure to advice and book for you the best treatment, that will complete your wellness holiday package. At guests disposal are following sport activities: 4 tennis grounds, a multipurpose court soccer/volleyball and a fitness center with body building equipment, possibility to play jogging track, bocce, archery. Rental bikes and quads for a fee. Very popular are also the services and water sports available at the beach (against payment): kayaking, boat excursions, stand up paddle, wind surfing facilities, sailing facilities, snorkeling and scuba diving centre. For the youngest guests, between 4 and 12 years, the Pullman Timi Ama Sardegna offers a Mini Club, whereas they are entertained the entire day and have fun with the staff of the animation team (this service is against a charge and has to be booked and paid on-site). The Pullman Timi Ama offers an international cuisine at the Restaurant “La Veranda” with its terrace which enjoy a beautiful view over the swimming pool and the bay. The half board includes breakfast and dinner at “La Veranda”, drinks are at extra costs to be paid on spot. The restaurant “Mediterraneo”, located by the swimming pool, is opened for lunch and for dinner (from 10 pm to 1 am) and it offers to its guests a light carte. The gourmet restaurant “Su Tea Rooftop Restaurant” (à la carte) is for guests over 14 years of age. It is open from Monday to Saturday during the months of July and August and is accessible, upon reservation, with a supplement to the cost of half board. During lunch time, is also possible to stay at Bar Piscina steak houses where salads, sandwiches and fruit salads can be found. The restaurant “I Ginepri” is located close to the beach. At lunch time it offers a light lunch (barbecues) while for dinner a menu (à la carte) with traditional dishes and fish specialities. The lively heart of the hotel is enriched by a beautiful swimming pool with sweet water. Along the swimming pool are at clients’ disposal sun beds, umbrellas as well as the open air buffet restaurant “La Veranda” and the “Bar Piscina”. A large car park and the opportunity to book interesting excursions are also available. Tourist tax – the municipality of Villasimius requires the payment of a tourist tax of € 4,00 per person/night (excluding children under 11 years) to be paid on spot. Double room furnished in a simple and traditional style. Most are located on the ground floor of the hotel. The private bathroom has a shower and hairdryer. The Classic rooms on the ground have a patio while the ones in the upper floors a balcony. All are equipped with table and chairs and overlook the garden and the hills in the background. Some rooms have no window in the bathroom. Spacious double room, furnished in a simple and traditional style. Located on the ground or on the upper floors of the hotel. The private bathroom has a shower, a bathtub, hairdryer, bathrobes and courtesy set. The Superior rooms on the ground floor have a small terrace ant the rooms on the upper floors have a balcony. 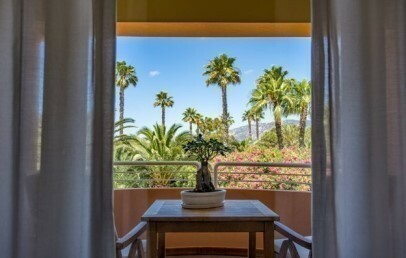 All are equipped with table and chairs and overlook the garden or the Mediterranean vegetation or the hills on the background. 3rd and 4th bed on request. Spacious double room, furnished in a simple and traditional style. Located on the ground or on the upper floors of the hotel. The private bathroom has a shower, a bathtub, hairdryer, bathrobes and courtesy set. The Superior rooms on the ground floor have a small terrace while the others a balcony. All are equipped with table and chairs and overlook the Timi Ama bay (Notteri Lake and sea). Spacious and modern furnished double rooms. 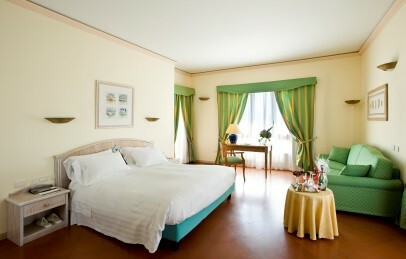 The Executive rooms are located on the upper floors and have an equipped balcony. The spacious and modern bathroom has a shower, a tub, double sink, hairdryer and courtesy set. The view is over the garden and/or the mountains. Spacious and modern furnished double rooms. The Executive rooms are located on the upper floors and have an equipped balcony. The spacious and modern bathroom has a shower, a tub, double sink, hairdryer, courtesy set and a window. The view goes over the nice bay and sea. Spacious double room, furnished in a simple and traditional style. Located on the higher floor of the hotel. It consists of a unique environment equipped with a sofa bed, which can accommodate a third person. The private bathroom has a double sink, a shower, a bathtub, hairdryer, bathrobes, courtesy set. 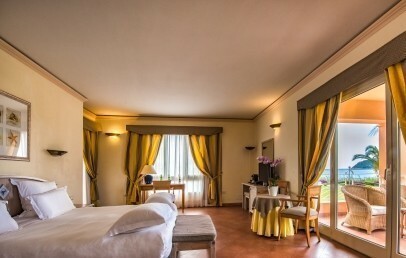 The Deluxe rooms present a large terrace with garden furniture and overlook the garden and hills. Spacious double room, furnished in a simple and traditional style. Located on the higher floor of the hotel. It consists of a unique environment equipped with a sofa bed, which can accommodate a third person. The private bathroom has a double sink, a shower, a bathtub, hairdryer, bathrobes, courtesy set. 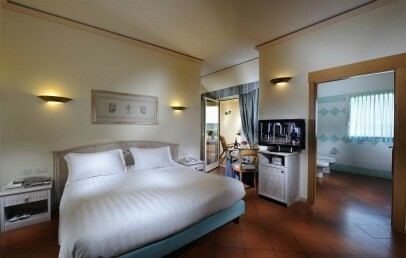 The Deluxe rooms present a large terrace with garden furniture and overlook the bay. Double room furnished in a simple and traditional style. Most are located on the ground floor. The private bathroom has a shower and hairdryer. The Classic rooms on the ground floor present a terrace while the other ones have a balcony. Both of them are equipped with table and chairs on the sea/bayside. The bathroom has no window. Long Stay - Book at least 14 nights and last 3 nights are free of charge! Long Stay - Book 4 nights and last night is free of charge! Early Booking - Book within April 30th 2019 and get a 10% discount on your stay! Early Booking - Book within May 31st 2019 and get a 10% discount on your stay (valid for stays between July 20th and August 2nd)! Early Booking - Book within June 30th 2019 and get a 10% discount on your stay (valid for stays between August 31st and October 12th)! Mini Club admission free of charge (lunch not included) for children from 4 to 12 years old (not valid from June, 1st to September, 14th)! Triple as Double: 1 person over 2 years old in 3rd bed free of charge (not valid from June 15th to September 7th)! For customers staying in an Executive room, Deluxe room or Suite: free use of beach umbrella and sun loungers in the first or second row (not valid from June 15th to September 14th)!